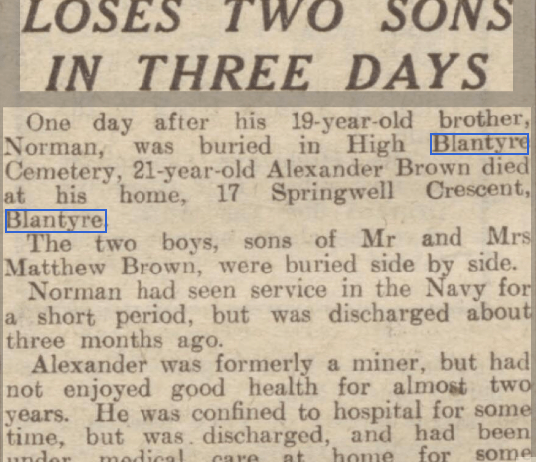 A terrible, heartbreaking tragedy was felt in Spring 1947 by Blantyre people, Mr and Mrs Matthew Brown. The couple, of 17 Springwell Crescent sadly lost their son Norman Brown, a Navy officer who had been discharged only 3 months earlier. Norman was only nineteen years old. The couple buried their son in High Blantyre Cemetery. Consumed in their grief, it was a week that would change their lives. Not just one day upon returning from the funeral, their other elder son, twenty one year old Alexander Brown also died at the family home. Alexander was formerly a miner, but had not enjoyed good health for almost two years. He had been confined to hospital for some time, but was discharged some months earlier, and had been under medical care at home for some months. I cannot imagine the grief those parents must have suffered in such a short space of time.